Happy May Day! On this day, we not only celebrate International Workers’ Day, which commemorates striving for fairer rights and working conditions for all workers. We also observe Beltane, the coming of summer’s longer daylight hours and heat that bring fertility to crops. This is traditionally celebrated by dancing around maypoles, and decorating doorways, windows, and May bushes with flowers. 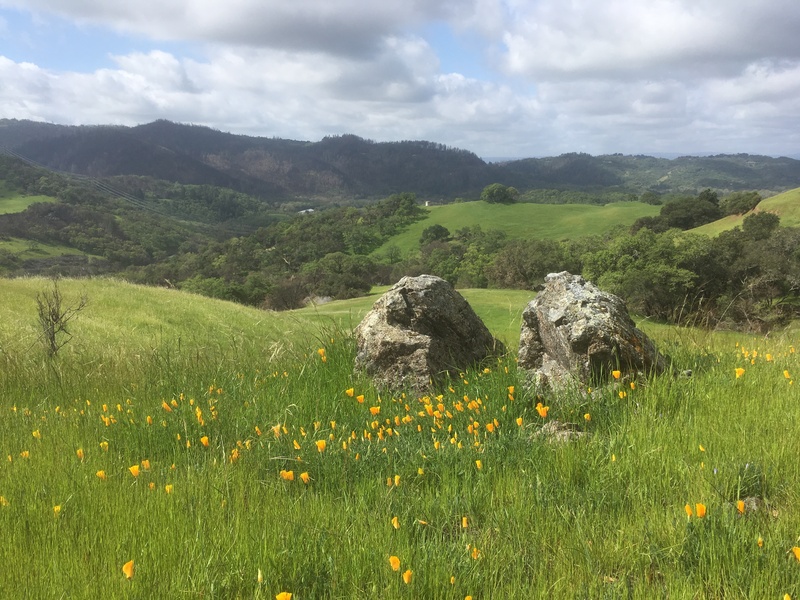 Our own observance led us to the Pepperwood Preserve, for a post-fire wildflower hike. Our guide, steward and naturalist David Self, educated us on how native Californians regularly maintained the landscape using fire. We who live in wildfire country have much to learn from those practices, and Pepperwood scientists are now considering regular burns – which can help control grasses and brush that burn hot and quickly spread wildfire. The overcast day contrasted with fields of brilliant color, leading from oak woodlands out onto open hillsides. Shaded stands of (edible) miner’s lettuce, and the nasty (and native) poison oak, thrived from the ash of last fall’s wildfires. 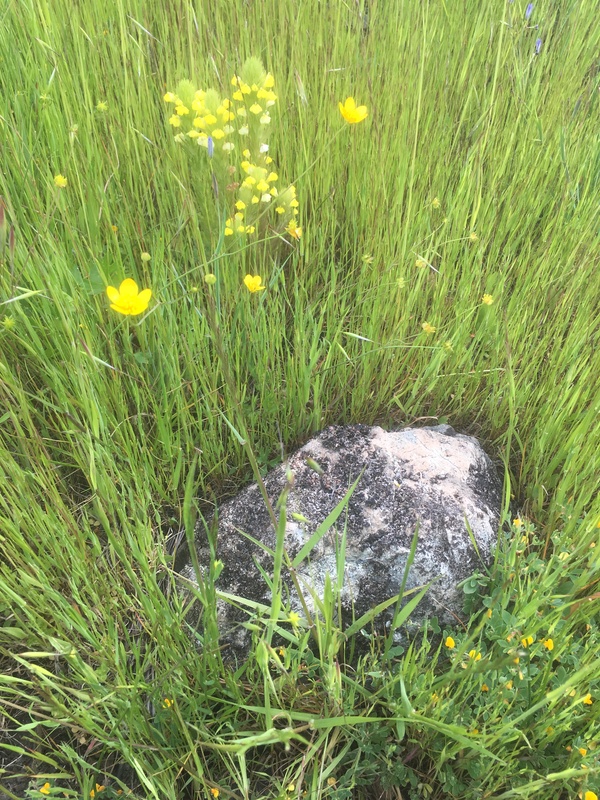 Plants like this thrive on disturbance, such as that of cows tramping the landscape. Bunchgrass roots go 4-5 feet underground in search of sufficient water, so are less affected by surface fires and dryness, and these can hold carbon for years. Oats (wild) were in bloom and going to seed. Hillside pea shone a deep magenta. 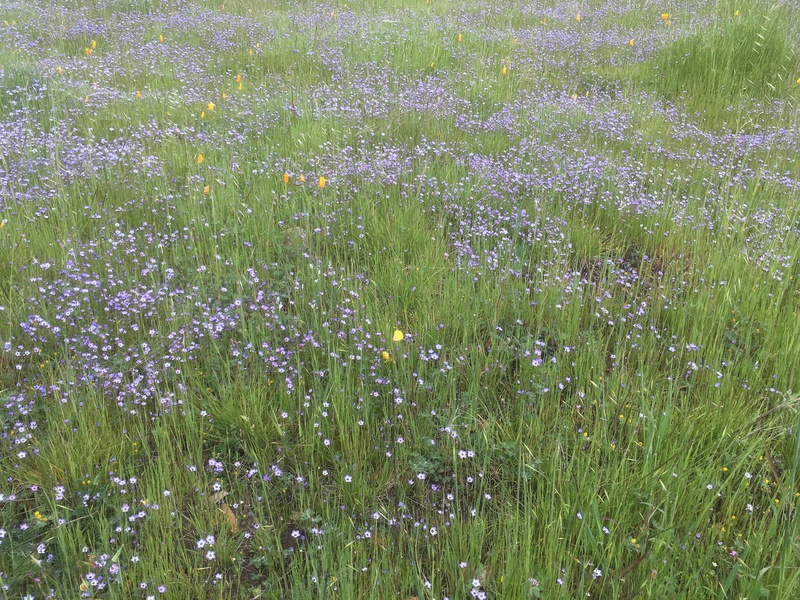 The iris relative, blue-eyed grass, was scattered among California poppies and buttercups, sack clover, and both sky and miniature lupines. Milk thistle, an edible non-native, also grew abundantly under the oaks, as did scarlet pimpernel, purple needle grass (the California state grass), and short sprouts of poison hemlock. The dwarf or California plantain provides caterpillar food for the Bay checkerspot, a native butterfly. Cream sacs, a fuzzy multi-flower flower, contain something like 90 single flowers on one stem. Blue dicks, as well as the fool’s onion or white brodiaea that comes up in our garden, are all brodiaeas – corm plants, and also thrive on disturbance, which allows their seeds to be scattered and the plants can regenerate. Some plants thrive on smoke, as others do on ash. Deervetch, Jepson’s leptosiphon, and butter and eggs’ delicate lines called “nectar guides” help long-tongued pollinators such as sphinx moth (or butterflies, flies) get into these long, narrow flowers. California apparently has ~1600 native bee species! Insects can see color, thus bees’ preference for blue flowers – which they indicate with their amazing waggle dance. 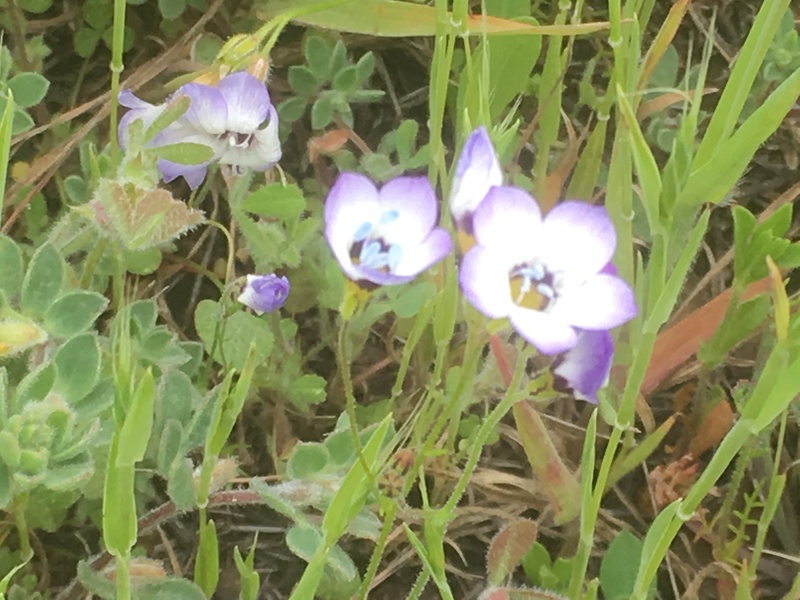 Blue dominated massive fields of bird’s eye gilia, a spectacular flower with powder-blue stamens, in greater profusion than usual due to the fires. 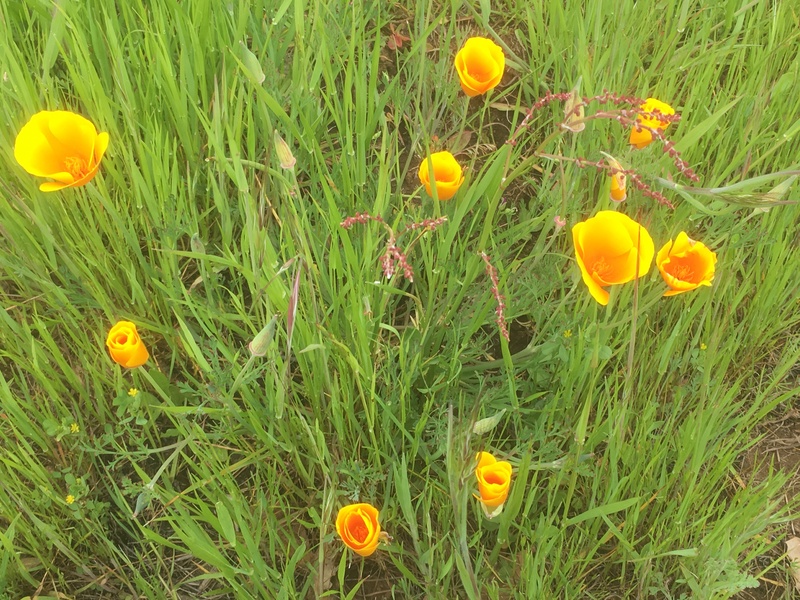 (On this walk, we saw less “fire-followers” specific to fires, than more prolific blooms of all kinds of flowers that thrive on ash, or other fire-related conditions.) Other highlights: hairy hawkbit: a dandelion and sunflower relative, with a milky sap. Filaree or storksbill: the “scissors” flower we played with as children, a non-native from the geranium family. Edible sheep sorrel, an invasive rumex. Some of the oaks and bay laurels are already resprouting, and will survive despite being burned completely. To the east, huge fields of cream cups contrasted against a ghostly black burned-out tree landscape, and grasses’ brilliant green. 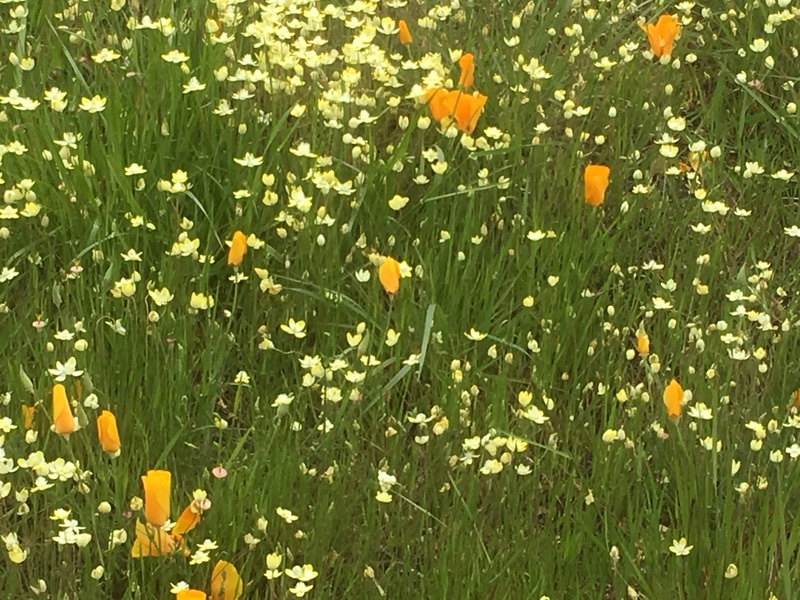 Red maids, goldfields, seep spring monkeyflower grew around springs in the middle of great meadows, serpentine spring beauty, gold wire – such were the treasures we walked among. 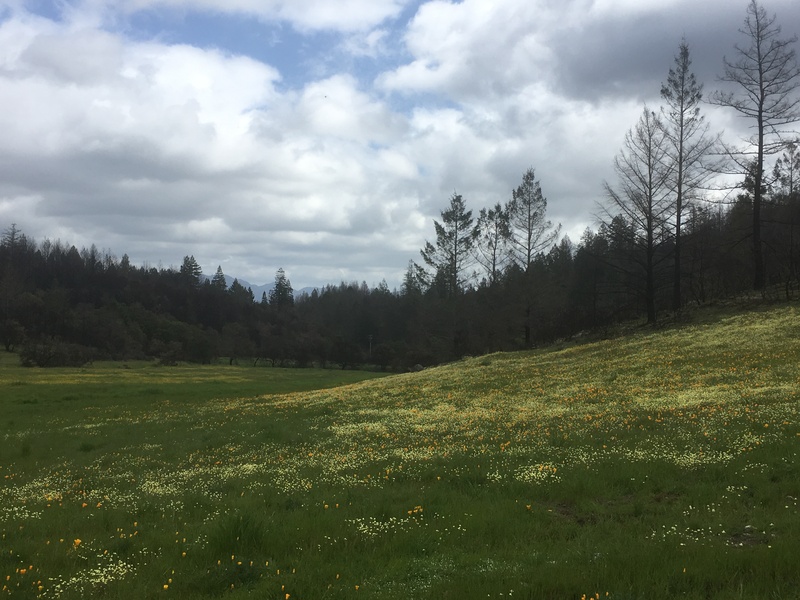 Yarrow (a native medicinal styptic plant), and other abundant species give us many opportunities for learning from native Californians, about land management practices, edible plants, and other uses. These may be more suited to this area than some of the non-natives and nonetheless lovely invasives currently here – and can teach us how to help rebuild a healthier ecosystem. I’ve heard a fair amount about indigenous land management practices, since the area of northern California I’m currently living in has a strong indigenous presence. However, I wonder if the changing climate will overwhelm traditional practices? If average temperatures get higher, summer droughts become more intense, and (most importantly) winds become stronger, will prescribed burns lose some of their utility? Perhaps, but it’ll probably be worse if we don’t try anything. That’s a very good question; it seems like integrating more traditional practices while taking into consideration our radically and constantly changing climate, is the way to go. A belated Happy Beltane to you as well! Oh, the adorable waggle dance… just lovely. This post made me feel as if I were back in the Bay Area (smile!). Thank you dear. Lovely photos I must say. Thanks, luv! I’m always appreciative of your support; sharing the moment with you in spirit!